Nah! Just random captions when I was revising for MUET ytd, when I actually believed that raisins could work wonders and make me cleverer overnight. 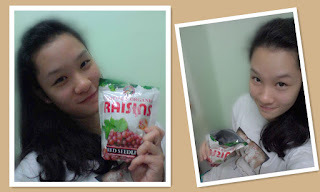 cuckoo* :P In fact, according to researchers, raisins DO HELP to improve memory k! Benefits of raisins are even stated in the erm...ok fine.. I could not remember the exact place I've read but I am pretty sure sharpening memory is one of raisins' benefits. You could just Google it up if you wanna try to proof me wrong. Speaking frankly I didn't expect myself to leave the life of a Sixth Form Student and will be hopping into college soon before seeing my STPM first semester's results. This sort of decision is really not easy to be made especially when you are having contrary reasons within yourself but then in life we should really learn how to make up our mind. As a result, I have finally concluded my hesitation with a no turning back decision. I don't know whether this is really the right path for me but since I have chosen this way I shall make things right rather than getting myself back into dilemma. After all making things right is just a pre-determinant towards a right decision. Agree? actually I still have not decide which one to publish first, guess I'll just let my mood decide. So peeps if you wanna find out, stay tuned! With the below #lastpicinschuniform, I shall say goodnight and sweet dreams readers! Just can't get enough of ABTM! Paying Tribute ~ "Flashbacks of NS"